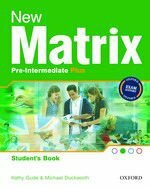 New Matrix follows the principles of the previous edition, with emphasis on maximizing performance in the school-leaving exam through a focus on exam tasks and techniques and thought-provoking, demanding material. Popular features improved and updated in response to feedback from Matrix users. Systematic building of key vocabulary to cover up-to-date exam topics. Effective production: speaking practice in every lesson on a wide range of topics, and step-by-step guidance for writing a variety of text types. Grammar knowledge checked and activated in use. Exam tips, techniques, and practice of exam-type tasks to give students confidence in the exam.